As far as adventures go, I am a lot like Bilbo Baggins of The Shire. I'm a homebody, and unless I am forced into an adventure, I am not likely to go on one. I much prefer to live out my exploits through characters in books while I myself remain safe and sound in the comfort of my own home. Exciting, huh? Well, for the past few weeks, I've had the thrilling opportunity to journey back in time and travel around the world alongside missionaries dedicated to bringing God's Word to remote, and sometimes hostile regions. Seed Sowers sent members of the Schoolhouse Review Crew a copy of Gwen Toliver's highly adventurous book, Seed Sowers: Gospel-Planting Adventures. Our family received a physical, paperback copy (165 pages/21 chapters) which can be purchased for $12.50 at Grace&TruthBooks. Author, Gwen Toliver, a fellow homeschool mom and Schoolhouse Review Crew Member currently serves as a "not-so-traditional-missionary" alongside her husband and eight children with Wycliffe Associates. As state-based missionaries, they help Bible translators do their jobs more efficiently by serving in administration at the Linguistics Center in Dallas, Texas. Being around missionaries practically all of her life and having a passion for lighting a fire under the next generation of believers, Gwen spent two years collecting missionary stories through in-person interviews and writing them down so families can hear about the amazing work God has done and is still doing through ordinary people willing to serve. Did you know that out of the thousands of languages spoken around the world, only 471 of those languages have the entire Bible? That means almost 300 million people still need to be able to read the Gospel in their own language. Staggering isn't it? Thankfully, God is using his people to change that! 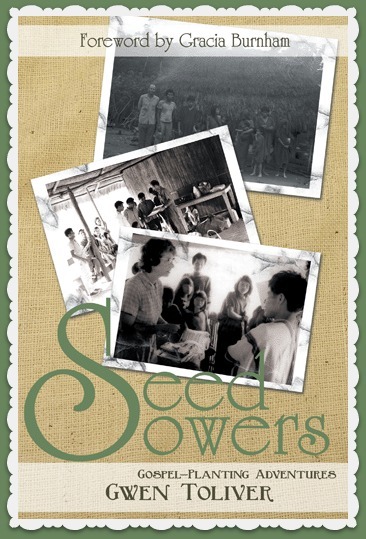 Seed Sowers reveals personal stories of twenty-one modern day missionaries involved in Bible translation. Bible translation is not an easy task. Much training is required to learn all the necessary skills. Also, translators have to learn one or more languages and sometimes have to even develop an entire alphabet in order to give people the Word of God in their "heart language." All of the accounts in this book except for one were unfamiliar to me. I enjoyed hearing fresh stories of God moving in the hearts of people who'd never heard the Gospel before. Some of the missionaries featured in the book include Rose Dobson who worked with the Kayabi tribe in the Brazilian jungle, Dorothy Shaler who had to live with a witch doctor near the Andes Mountains in South America, Bob and Jo Ann Conrad who took the Gospel to a cannibalistic tribe in Papua New Guinea, Lynn Landweer who learned more about language from a bird than from the Watut people whom she was trying to reach, the Benson family who barely escaped an encounter with the Shining Path terrorists in Peru, and many more. The one story with which I was familiar is a story which most people have probably heard about. It's the account of Nate Saint, Pete Fleming, Ed McCully, Roger Youderian, and Jim Elliot. Only this account is told from the perspective of Don Johnson, a member of the ground party who searched and found the bodies of these missionaries. Even though I already knew much about this story, it was still quite a tear-jerker for me. I am truly amazed by the dedication of the missionaries featured in this book as so many of them faced life-threatening situations in order to bring God's Word to unreached tribes! Wild cats, poisonous snakes, deadly diseases, hostile people, treacherous landscapes, and whatever else you can imagine - none of these dangerous obstacles kept God's people from carrying out His calling on their lives. As soon as I received Seed Sowers in the mail, I buried myself in the book and finished each and every story in about three days. Once I finished the book, I began reading it to my children after our morning devotions. Presently, I am about half way through the book with my kids. It's still a delight the second time around. I am kind of glad I read it first so I could be better prepared to pronounce all of the tricky tribal words! (Thank goodness for all of the pronunciations in parentheses!) If you are not planning on reading this book aloud, it is suggested for independent readers 6th grade and up. Hebrews 10:24 says we should consider how we may spur one another on toward love and good deeds, and I think sharing these inspiring, God-sized stories with your own family is one way to do that! As John Piper says, "There are only three kinds of Christians when it comes to world missions: zealous goers, zealous senders, and disobedient." Thank you, Gwen, for sharing these personal testimonies and inspiring the next generation to get involved with spreading the Good News to the whole world! 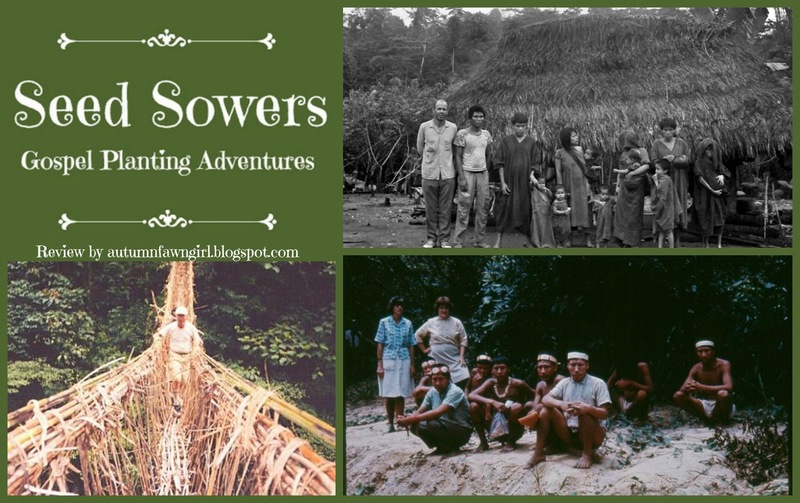 Click on the banner below to read more Seed Sowers reviews! This book made me think of Hebrews as well (chapter 11). Thank you for the beautiful tie-in of Hebrews 10:24. You are so right! I love that John Piper quote, Brandi! Thanks for your review and your encouragement. May the Lord continue to use the book for His glory!